This event is now over and the winners are announced below! Other prizes include an eBook from each author! I’m interested in reading Star Shadow by CJ Cade, Knights in Time by Chris Karlsen, and To Discover a Divine by Tessa McFionn. I mostly use the kindle app on my laptop. I am reading ebooks on both my Kindle, and my Apple iPad. Love it! 1) Leave a comment for a new to you author who you now want to read. What inspired you to want to read their books? Hard to choose one, liked a few, but if I have to pick - Carole Ann Moleti. Her "Breakwater Beach" have risen my interest. I wonder what would happen with such a love triangle. 2) What genre have you been reading lately and what inspired you to want to read that genre? I read most historical romances. It's my favorite genre. I guess because it's somewhere between reality & fantasy. 3) What eReader are you currently using? I use a simple Kindle & Pocketbook. I've been really into romantic suspense lately. I love that there's a lot of tension and mystery and danger. I'm currently reading on a Kindle Paperwhite which I love because I can carry 5,000 books with me, lol! But I still enjoy paperbacks! Right now I'm either reading mysteries or fantasies. This is mostly bcz I have ARCs to read, lol. But I really do love mysteries! I’m using my iPad as my ereader with both kindle and ibooks apps. I also read books in print. I typically use my Kindle Touch, easy way to bring a ton of books to fit my mood as I'm out and about. I lean heavily towards PNR or UF, with some suspense or sci-fi mixed in. I like stories that take me out of my everyday. I love my kindle it means I can take so many more books with me everywhere. But I also love my "real" books too. I'm kind of interested in trying out some CJ Cade now, always like some scifi romance. But lately I've been reading a lot of queer romance, especially contemporary or fantasy f/f. There's some really good stuff. As for my e-reader, I tend to just use the kindle app on my laptop. I don't have a real ereader lols. I have a kindle which I absolutely love. I have found several new to me authors and their books that I want to read from there experts . I'm having a blast doing this hunt!!!!!! I want to read "Back in the Rancher's Arms" by Elsie Davis after reading the blurb. I appreciate that the hero was willing to let the woman he loves go for the time needed for her to accomplish her dream. I've been reading a lot of love at first sight stories lately. I read two in a row and was hooked. I'm starting to enjoy historical romance, prompted by a few summer reading challenges! On Jul 04, 2018, rskeens said: Love this! This was great fun! I’ve found some new authors that I will be trying based on book blurbs! Thank you! I don’t have a Kindle, it I would love to have one, but at this time it isn’t possible! On Jul 03, 2018, booksforme said: Love this! Show me the Honey by Cathryn Cade, and To Discover a Divine by Tessa McFionn. On Jul 03, 2018, ellenlevickis said: Love Ereaders! I LOVE my 10" Kindle HD! For years I have had only print books, and dreamt of someone inventing something to make incessant reading easier (problems with books getting wet, books becoming damaged from folding pages, shelves full of thousands of books becoming jumbled. Then a "few" years ago I purchased the first Kindle and loved it although it was a bit clumsy (I still use the next one, the DX, at times). Then I purchased a Fire, then a Nook. Loved them more because could use for other things. And now I have the latest Fire! If it had a keyboard I would use it for everything. The reason I love it the best is the battery life. The only reason I would go back to strictly paper is if all electricity happened...then I guess I would have bigger things to worry about. I enjoy using my kindle, but I still love to hold an actual book in hand at times! On Jul 03, 2018, angienb said: hi! I love the books this time. So many paranormal which is my favorite genre as well as sci find. Thanks for this contest and this way of meeting new authors. On Jul 02, 2018, ArlenaDean said: New Authors for me! I would like to check out the following authors: Joanne Jaytanie, Veronica Scott and Sharon Cooper. They are are romantic authors that sound like the kind of reads that I would love to read. I hope I can win an Amazon gift card. Thank you for the chance!! Wow, what a contest full of great prizes. I'd love to win the tablet, but would be ecstatic to win anything. I prefer print because I like the feel and smell of books and being able to put it down and pick it up with out electronic devices. I do use a Kindle app for the computer. It helps with storage. I am reading Historical romance. Thanks so very much for the opportunity???? it was so much fun????????? I have found so many new authors & fabulous reads!!?? I have both a Kindle Fire HD and a Kindle app on my android Samsung Galaxy Tab A tablet. I always enjoy the hunts and finding some great books and new authors. Like : Janna MacGregor, Laura Kaye, Gwen Brodie, Catherine Cade, Cheryl Holt. I have both a Kindle Paperwhite and an Android tablet. I also read paper copies, and listen to audiobooks. It's great to have so many choices!! I have a Kindle and read both e-books and print ones. Love them both. This looks like an amazing list of books to read! What great prizes as well! I am currently reading a lot of romantic comedies. There is a lot of stressful family stuff going on and I like to escape with romance and laughs. Other than a few specific authors whose books I buy in print, I generally get e-books. It's mostly just a space issue. As always I find authors I want to try. Karen Renee, Janna MacGregoe, Jennifer Faye and Elsie Davis. Keep the hunts coming. I generally read historical romances. I enjoy reading e-books on my KIndle but occasionally read them in print. I love to read books in print and ebooks both. As for the genre I love historical romance and and paranormal romance. I like thrillers, detective and forensic stories and mysteries. I've always been good at puzzles and figuring things out. 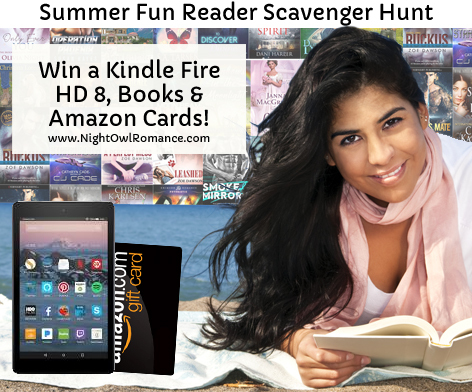 I really enjoy reading Romance Suspense and I love this contest. I get to read new Authors. I have been reading a lot of paranormal books lately because I love all things paranormal. I've found Unforeseen Riot by Karen Renee and also Die Run Hide by PM Kavanaugh that look good. Their write ups lured me in. Most of the time I read on my Kindle Paperwhite though I do still read print books too. I love the new authors I’ve discovered here. Especially Gwen Brodie. I can’t wait to start reading some of these books. ?? I currently use a Kindle Paperwhite for reading e-books and I really like it, but it will never replace print books for me. I just like the feeling (and smell...yes, I sniff my books!) of the book in my hands and turning actual pages. I split my time between Print and my Kindle. Now that I've finally started going back to the library I'll probably read more Print. Some titles I added to my tbr list are The Grim series by Dani Harper, The Blakeney Brothers Adventures by Vanessa Liebe, Leaving Yesterday by Zoe Dawson, and some more. This was a fun competition and a lovely way to find new authors. I'm going to try new-to-me Gwyn Brodie. I love a good historical, especially if they involve Scotsmen! Elsie Davis is a new to me author. I loved the sound of Dylan wanting to win her back and how he will do it. I read on my kindle but still love reading my paperbacks. I really enjoyed the scavenger hunt and found at least one new author to look for and she is Christina Lorenzen. I love books with animals in them and her book "Howls & Hearts" looks like a good one. I love the casual cover for the book, A Perfect Mess by Zoe Dawson. It reminds me of vacations with nothing to do. I like reading Chick Lit when traveling as it's light and easy; perfect portable for the beach or plane. On Jun 24, 2018, saleago said: Thanks. I enjoy doing these type giveaways! I had a lot of fun reading about the new authors that I did not know about. I enjoyed the game and what it brought before me. I still love paperbacks, but I find myself reading on my Kindle 98% of the time. I love that you can read at night without putting on the lights. I discovered Morgan O'Neill and have added her to my TBR list. I still love to turn the pages of a paperback, or hard cover, I visit the local library regularly and usually come home with my arms full of books. I love to read so I have a Kindle and read many books on it as well. I travel a lot and enjoy reading my Kindle eReader. I LOVE paperbacks but i had sooo many and it was starting to be too much so i switched to Kindle. I still love paperbacks! I read only ebooks on my Kindle now. I love historical romance and Sci Fi Romance, Janna MacGregor and CJ Cade are new author to me, I would like to read their books. I´m not reading now :( I use a Kindle app. I primarily use a Kindle Fire, but I also have a Dell tablet. Dani Harper and Zoe Dawson are my faves..also looking forward to Julie Rowe and Sharon Cooper. I have a kindle but prefer print books..I like to turn pages, and be able to go back to check on somethings I may have missed..it's easier with a real book!! Thanks for the hunt!! There are so many books I want to explore that I'm seriously thinking about gettiing a part time job! I read from my Amazon tablet or paperback. Lately I've been reading all types of romance. Love historical romance. I was turned on to historical romance when I read Gone with the Wind. My first novel. Been my favorite ever sense. Read paper books & E reader. I go between my Kindle and print books routinely. I get most of my books from the library, and the way I get them depends largely on how they are available. I have a nook and read paper as well. There is nothing like a good book in your hand sometimes. This story kept me interested to see what was going to happen next. I am not giving any secrets away, you will need to get a copy and see for yourself. I cannot wait to read the others in the series. On Jun 18, 2018, Lashea said: Romance. Comment on at least one of these items. Leave a comment for a new to you author who you now want to read. What inspired you to want to read their books? What genre have you been reading lately and what inspired you to want to read that genre? I read paranormal romance, contemporary, and historical. I just finished DIRTY WORK by Chelle Bliss. I also listen to audiobooks during my commute (over 2 1/2 hours per day). I'm currently listening to a Cozy Mystery - DANCING WITH A GHOST by Angela Pepper. What eReader are you currently using? I use a Kindle app for visual reading and Audible for listening. For fun, I have a blog and do reviews... thank God for authors! I have been into a lot of ebooks though I have a few collection of paperbacks and hard bound books as well. I usually read at night so the e-reader comes very handy because I don't need to turn on a reading light. But of course, the smell of paper, flipping pages, and holding a physical book in your hand is a very different feeling of its own. Found some great books to add to my TBR list. Thanks for the chance to win and good luck to everyone. I still prefer print books, but I do read books on a Nook & Kindle. I still read a combo of print and ebook, although - due to space limitation - I collect more and more ebook for new releases while keeping the prints I have. For eBook, I’m reading using the combination of Kindle, Sony eReader, ebook apps on my phone and computer - depending on when/where I read. Hi! I love to read on my Kindle Fire. I can have many books with me at once! I have read a few romantic suspense books lately, that I normally do not. I usually get so involved in the story I can't put the book down and then I spend one whole day just reading. I love reading print. I especially love reading hard cover books. There is just something about reading a hard cover book that I really enjoy. I also love collecting Author signed books. However most of them are paperback books. I like to read on my Kindle Paperwhite especially when I am waiting in lines. One day I got a machine named kindle and found the pages so easy to turn and that my hands didn't hurt so much like they did when I held a paperback open. More than 4 years later and I have issues making out the words in a paperback. Now I very much stuck with kindle fire and e-books! On Jun 17, 2018, Tabby said: Love to read!!! I read off my kindle fire and my phone. I love that I can take them everywhere. I have been reading more historical recently because I love learning about history. Since I enjoy reading time travel romance, The Thornless Rose sounds fascinating. It was also interesting to know that Morgan O'Neill is actually two authors writing as one. Even though I read ebooks, I still prefer print books. Print books just feel better and I don't have to worry about recharging a battery. Thanks for sponsoring another great scavenger hunt! I use my kindle app to read books. You are a new to me author but your books sound so good I'm going to start reading them right away! MacGregor's Daughter because I love that genre and all books Scottish. Also Holiday Spirit by Dani Harper because I love her books. My first choice is Print books but I'm the last 6 months I have started reading Kindle books. I like to read print, however, I have a couple of kindles that I use as well. I am currently reading paranormal . Gwyn Brodie, new author: MacGregor's Daughter is Historical and Scottish. Read Historical, always first choice. I found Survival Instinct. I love the mystery of it. I have not read Roxy Harte before and hope to read this one. I like both print and ebooks. There is something about holding a book and not worrying abut a charge. I am looking forward to reading Unforeseen Riot by Karen Renee, who is a new author to me. I enjoy MC books and this one sounds really exciting, the chemistry between the main characters sounds explosive. On Jun 16, 2018, ljwaters said: oops! I was half asleep with my first cup of coffee when I filled out that my user name is Lacey Waters when it's actually ljwaters :/ can I still play? I read both my kindle and print. If I want to re-read print is easier for me to find. I like the convenience of my Kindle for buying and carrying around. Though I still occasionally read print books, I definitely prefer reading on my Kindle. I especially love having the Kindle app for my phone. It's like carrying an entire library in my pocket! I read on a kindle and collect signed paperbacks. I primarily read on my Kindle but I still buy plenty of physical copies, too. I just couldn't make a clean break from paper. Thank you for the hunt! All the books sound good. I read paranormal romance. and so much more. Ive been on romantic suspense/thriller books lately. I love the edge of your seat having to know what happens next. I love reading from my Kindle,The one I have is so loaded now that it takes so long for it to come on. I have had it since 2012. Would love a new one. When I read is during the evening at bedtime, and while waiting in doctor's offices during loved ones visits. I love paranormal ones, and military romance ones. Been a member of Night Owl Romance for quite some time. I'm a librarian so I read across several platforms because I have the opportunity and exposure- on my own I use Kindle on my iPad and I have KU, I also use KOBO. Through work I use Overdrive and Hoopla. That being said I also usually have a few paperbacks checked out also - I'n not a hardcover reader. Unlike a lot of people I'm not genre driven, but format driven in that I'll read pretty much anything electronic or paperback, but I can't stand being chained to a hardback - I;m not that fond of trade paperbacks either. I read mostly Historical Romances set in the 19th century and early 20th century. I do like Regency and Victorian set mysteries too. I prefer print books but when a print edition is not available, I do go for ebooks on my Kindle Fire. I have several favorite genres. I love several genres but the one I read the most is contemporary romance. There are several of the authors whose stories I want to read. Great giveaway fun! I typically use my ereader for books - Kindle paperwhite - and have been reading mostly romance lately. I still like reading my books in paperback form. I have a kindle but very rarely read books on it. On Jun 14, 2018, angie booklover said: Kindle or Printed Books? I currently read about 50% on my iPad using the Kindle app. I would really love to have a Kindle because the iPad is quite heavy and cumbersome. It's definitely not convenient to carry around. A Kindle is on the top of my wish list. I also love reading an actual print book. Nothing beats the smell of paper and ink. I mostly use my kindle to read books. I also have a Nook color since my first kindle, when they first came out, was only black and white. I used the Nook for biographies that had color pictures included so it doesn't get used as much as before. I read on a Kindle Fire but I also love print and audiobooks. I read on a kindle, but I also love reading out of hard cover books. I have over 400 books on my shelf right now. I am a kindle girl. Love this hunt. Just finished Pinky Promised. Love a good love story with action of course! I read on my Kindle. I love print books but the e-reader is so much easier and I've come to really rely on the light! Looking forward to reading my signed copy of You Never Forget your First Earl by Ella Quinn that I received from her this past weekend! Historical romance is a genre I've been reading a lot lately and it all started with The Guardians series by Wendy Saunders! I love scavenger hunts. I hope I do well. Thank your for the opportunity to learn about authors I haven't read before. I tend to read romantic suspense and paranormal romances most often. I like reading on my kindle fire. My eyes strain too fast to enjoy a print book for more than a few chapters. With my kindle I can read all day. The blurb for her book sounded really good and I am interested in reading it. There are several authors that I have read and after the scavenger hunt I am going to look them up and read more books by them. Thank you for the scavenger hunt! Psihramis, glad to hear that. I have a kindle fire, but usually use the app on my iPhone. Thank you for another awesome Scavenger Hunt! I love the Summer Fun Scavenger Hunts! I have a kindle app on my tablet and lots of books on it to read but I only read them if I have no physical books to read. There is nothing like reading a paperback. I think its the weight of the book in my hand and the smell of the paper and ink. I love ebooks but nothing beats a real one. Hope I win this time! These things are so much fun. HOPE I CAN WIN A BOOK!